This blog is usually about design; today its about family. My Aunt Ruth passed on Sunday, and i was honored by being asked to give her eulogy. With this honor came the burden of asking questions about her life to those who loved her deeply – her siblings, her children, and her grandchildren. Although painful at times, their stories were simply full of joy. I wanted a place for the stories to live beyond the service, this blog seemed the perfect place for family and friends to access them anytime, anywhere. 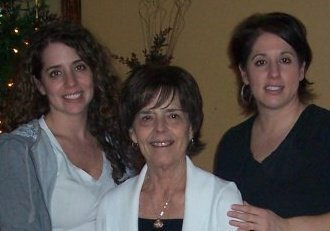 The Sweet and Elegant Auntie Ruth (center) with daughters Julie (left) and Gina (right). Image – the deepest ocean blue shag carpet, the Golden velvet wallpaper, the golden candlesticks sconces and the Chandelier. Well this was simply the fanciest place I knew growing up, and if it wasn’t for that I’d and rest of you would never have been exposed to “good taste”. Auntie Ruth was indeed elegant. Classy. And in my eyes the closest thing to royalty that this family had. When she was a kid, along with her sisters Anne and Susan, they would wear their white bucks, and their green and yellow Holy Name band uniforms….marching in parades. This one time in a competition aunt Ann marched the band along with Ruth and Susan not in a simple straight line past the viewing booth, but in a moment of panic instead made several strange and precarious turns zigging and zagging the band across the road much to the amusement of onlookers. As Auntie Sue wacked her symbol and Auntie Ruth beat her drum, and the band played on. Well, leaving her drums behind, Auntie Ruth found her way into Modeling. She was discovered while working at Friendly’s as a waitress…and even ran for Miss Springfield! She came in fourth. Now running for Miss Springfield, steps us back to that “royalty” that I mentioned earlier. There are certain gifts that royals must possess in order to royal it up: they need a deep love of God, they need a fierce love of family, they need the ability to tell a good story and finally they need just a touch of Zany. 1) A Deep Love of God: Christ was and is simply present for Auntie Ruth: all the way from the pictures on her walls through the pages of her bible. And even as a nightlight in her bathroom glowing safe passage to the toilet. Pastor Geno, Harlo White and Benny Hinn guided her spiritual walk with Christ, but her grandson Jordan was her study partner going to prayer meetings and listen to tapes. When I asked Jordan his favorite memory of his grandma, without hesitation he said studying the bible with her. With Auntie Ruth, the breath of the Holy Spirit was simply one laugh or smile away….AND sometimes in several Halleluiahs in tongues I dare not speak. When she was given her prognosis, she exclaimed “I’m not afraid! I know where I’m going! But do you know where you’re going? !” pointing to a startled room of clinicians. She was fearless in death, and was so ready see the face of Jesus. 2) A Fierce Love of Family: Her grandbabies adored her, and she adored them. From putting on graduations for her “Littlest Angels”, to making the best toast – little Jacob says the secret was using Italian bread -, to being a real speed demon in the car according to Alliyah. Mia told me her favorite memory was grandma teaching them the turkey song, and last night Mia and Michael not only sang it for me but danced it as well. I learned that Joshua proudly showed his grandma his driver’s permit in the hospital a few weeks ago. The problem is Grandma had been teaching him to drive long time ago. Now that’s illegal AND that’s love! Finally Johnny shared that his favorite memory was his grandma clowning around with her new wig on her birthday. I can just imagine the light of her smile and twinkle of her eyes during these shenanigans. She loved all the games, all the recitals and all the plays. Even though she didn’t know the rules, who was competing, or what the play was about. It didn’t matter. Her little ones were in it, and therefore it was GOOD. And she loved her Reggie. Everyone needs a handyman and Reggie was hers. Fixing her car and home, he kept her running. 3) The Ability to Tell Stories: now really? Is there anyone who can tell stories better than Auntie Ruth? Now lets be clear. Stories are not depositions. They are lively half-truths brought to life with rolling eyes, raised eyebrows, big smiles, different voices, all punctuated by some really intense hand gesturing. Telling stories about being touched by the Holy Spirit or about her Rufus, Baby, Blue and Belle…all were equally riveting, and like any storyteller, she never told it the same way twice. 4) A Touch of Zany: From her obsessiveness with a clean and proper house, to her infectious cackle of a laugh, its her touch of zaniness that brought smiles to our faces. Remember the time John John decided to sneak up on his mom for a good scare while she was vacuuming? Little did he know that Auntie Ruth has a degree in the vacuum cleaner weaponry, and beat the crap out of him. Or that time she thought it was a good idea to nap while Auntie Ellen was cutting her hair? Auntie Ellen just kept jabbering and cutting and cutting and cutting..and cutting…and cutting…. Well when Auntie Ruth woke and looked into the mirror she was lost in “oh oh oh oh my goodness”. Or “Baaaaaaby! Granma’s Baaaaaby!” You know that time she went hunting for her cat “baby” all over the neighborhood, finally found it several houses away, scooped it up, carrying it home…only to find HER cat curled up in her house sleeping. Needless to say, the “mistaken identity” cat in her arms was none to pleased being dragged into a stranger’s house. And sadly she too was plagued with the Stebbins affliction of that “occasional trip.” Remember her tumbled over the hassock [ottoman] at Grandma’s? You know, when she belly flopped right into the kitchen in front of everybody? My guess is that our Royal Auntie Ruth, on having passed from this world, lost all her elegant composer and did an Olympic 100-meter dash for the Pearly Gates, tripped and belly flopped right into Heaven. Pure joy! John will miss the mom who is simply proud of him. Gina will miss the quiet mom-daughter conversations on life and family. Julie (aka Mouth) will miss those reassuring gentle moments when her mom would simply rock with her. As much as we are going to miss Aunt Ruth, AND WE ARE GONNA MISS HER, we need to remember where and who she is with. I know she is laughing it up with Auntie Charlotte, Uncle David and Aunt Ann, and Gram and Gramps. I mean, come on, she just belly flopped into heaven! Now back when I was 10 years old living on East Alvord Street, my mom was on vacation in Puerto Rico, and my dad the fireman was called into work. It was only 6pm, but to me it was the middle of the night. I started to hear spooky noises all over the house, and freaked out. In tears and clutching the phone I called Auntie Ruthie. “I’m all alone!”, I cried. Not five minutes had passed when she swooped in, bolted in to the house, and hugged me saying “Christopher, You are never alone! Aunty Ruthie is right here!”. Well Auntie Ruthie, right back at you. You were never alone, and with Jesus you will never be alone again.